Greetings to all from the peace nomads. We have had no fixed address since January 2000, when Jim took early retirement from the Australian Foreign Service in Nairobi. Since then, we have lived and worked in the following places: Nairobi, Kenya; Watamu, Kenya; Bosaso, Somalia; Kagadi, Uganda; Beijing, China; Oakland, California; and Tucacas, Venezuela. In Tucacas one stable reference point is our Caribbean beachfront apartment which we courageously purchased in 1999 before it was built in monthly instalments by fax from Nairobi. We were in China from February to June 2003 teaching International Relations at the Beijing Foreign Studies University. We were founding members of the Beijing International Peace Vigil , established as an alternative to the war in Iraq, and working for lasting peace through UN reform (see the web site http://www.peace-vigil.org for more information). One of our favorite activities in China was ---eating. Yes, the most marvelous interesting food that was so reasonably priced we could invite many friends and have a wonderful evening together. One big advantage to being in China was we were able to spend time with Hsiao Li, Jim's mom, Jim's relatives and his niece Susan Lawrence. Pamela went to the USA in June 2003 to visit her son Gabriel in the San Francisco Bay Area with side trips to the Sierra Mountains and Los Angeles to visit her son Nathan. At Jim's urging she had a Chinese style dinner for family and friends at a Burmese restaurant in San Francisco. Jim attended as a cardboard cutout. Jim and Pamela decided that now was a good time to sell Jim's house in Australia and buy a condo in Oakland. Gabriel and Pamela with the help of her mom, Bette Silver, bought and set up the apartment in record time. In October 2003, Pamela rejoined Jim for a few days of visiting with friends and family in Beijing, then back to east Africa, which has been their main home base for the past eight years. They went to western Uganda to work at the Uganda Rural Development and Training Programme (URDT). 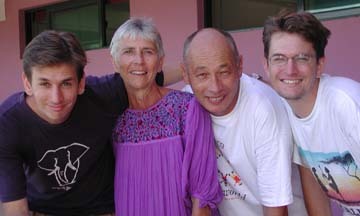 Then as usual, family reunion in Venezuela in December and January 2004. In February 2004, back to Uganda to continue their work at URDT. They managed to squeeze in three weekend trips to Murchison Falls, Queen Elizabeth National Park, the Ruwenzori Mountains and the Kibaale National Forest. In June 2004, Jim and Pamela were joined by Nathan and Gabriel for a camping tour of Kenya of some of their favorite places, including Lake Bogoria and Samburu. In July 2004, Nathan founded Hot Sun Films/Sinema Jua Kali, www.hotsunfilms.com and previewed a short film on the Mau Mau, called The Oath. In August 2004, Pamela and Jim went to Bosaso Somalia to work with Horn Relief. Jim and their dear friend and colleague Fatima Jibrell, founded Sun Fire Cooking, www.sunfirecooking.com to sell solar cookers to replace charcoal as a step towards saving the fragile arid environment. Just when we were thinking to leave east Africa, we founded two local businesses! In October and November 2004, Pamela and Jim were in the USA visiting Jim's mother who has moved to Washington DC, Pamela's mother in Kansas City and Nathan and Gabriel in California. In December 2004, back to Venezuela for friends and family at the beach. In 2005 Jim went to Bosaso Somalia to help Fatima with the start up of Sun Fire Cooking and Pamela to California to help with Hot Sun Films. She started a film group Friends of African Film in Oakland, California. Jim and Pamela worked on preparing for publication, "Bold Plum", Hsiao Li Lindsay's (Jim's mother) memoir of her exciting and dangerous life working with the Chinese Communist guerrillas in Japanese-occupied northern China, 1941-45, www.brushstrokebooks.com. Our permanent email address is: mukinduri@bigfoot.com. Please keep in touch. We would love to hear from you.